MSOfficeMetadata Metadata about an Microsoft Office file. MSOfficeMetadataI18n The internationalized string constants for the org.modeshape.sequencer.msoffice* packages. MSOfficeMetadataLexicon A lexicon of names used within the MS Office sequencer. 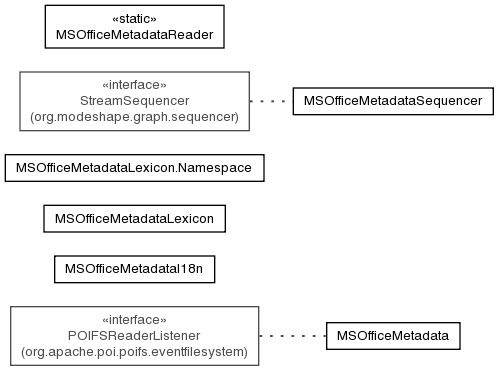 MSOfficeMetadataSequencer A sequencer that processes the content of an MS Office document, extracts the metadata for the file, and then writes that metadata to the repository.